Now I was born in Thibodaux, and I’ve always heard of Morgan City referred to as the Tri-City area, but I had to look up what the three cities are. I’m not positive, but I think it means Morgan City, Berwick and Patterson. Uncle Aaron didn’t come from any of those cities. He was born and reared in Bayou L’Ourse, which was apparently close enough for the memorial organizers. At some point, I begged a family member with possession of the old family photos to loan them to me so I could scan them in. The only photo we have of Uncle Aaron was among them. I sent his picture to the memorial. Now there will be a face with the name. I’m honored that Uncle Aaron was included in the memorial. He died long before I was born, but we were always told about him. He died in France during World War II. The story is that he was a military cook who got tired of cooking and volunteered to become a soldier. He died a week later – or so the family story goes. It’s probably more likely that he was a cook initially and then pressed into battle as the ranks thinned. I decided to go in search of the real story. Excuse me while I put on my Nancy Drew hat – and please excuse how incredibly long this entry is. I want to show just how much genealogy records can tell you about a relative. We’re very proud of Uncle Aaron. He died defending his country, and I can only imagine that joining the military was a bit of a culture shock for him. The 1940 Census showed Aaron living with my great-grandparents, Jean Jules Hebert and Eugenie Benoit Hebert, in Assumption Parish. Also at home were Uncle Wilfred and Uncle J.T. Uncle Aaron’s occupation was listed as moss picker. I never quite understood the moss picking industry until recently. What did they do with the moss? Someone explained to me that it used to be mixed with another substance to finish walls. It was the olden day drywall. As for education, a 23-year-old Uncle Aaron was listed as finishing the 5th grade, which probably was about right. My grandfather, who was his brother, didn’t get any further than that. You went to school until you were old enough to work. My family lived off the land and the bayou. Uncle Aaron’s native language was listed as French. This is interesting to me. I would imagine this means that he learned French at home first and then English during his few years in school. However, he must have mainly spoken French since he considered this his native language. I wish my granny had spoken to me only in French so I could have learned that Cajun French. Instead, she was quite proud to know English and refused to teach her children or grandchildren Cajun French. That native language made her feel backwards. The same year the census was taken, Uncle Aaron filled out his draft card. My grandfather filled out one as well, but he had flat feet. 1940 was before the U.S. entered World War II. However, things were tense on the worldwide stage so men 18 to 65 had to fill out draft cards in preparation. The draft card can tell you interesting factoids about your ancestor. For example, at the Hebert manse, there was no phone in 1940. I also learn that Uncle Aaron was born five days after Christmas in Amelia, which is across the bayou from Bayou L’Ourse. I don’t know if he was actually born in Amelia or if he just listed that since it was the closest town with a post office. I now know he worked for Martial Creador. I assume this was someone at the moss gin listed on the census. So then I went further afield and found my great-grandfather’s draft card. It shows me that he couldn’t sign his name so he apparently received zero schooling. His name also is listed as Jules Judeon Hebert when in fact it was Jean Jules Hebert. His mother came from a wealthy family so I always assumed that she received an education and would have taught her children to read and write. Apparently I was wrong. It’s also possible that Jules didn’t understand what he was being asked. He only spoke French. I know this because my mother only spoke English and could never really converse with him even though she grew up next door to his house. But back to Uncle Aaron. Now I want to know when he enlisted. I should probably add that Uncle Aaron, who was all of 28 when he died, never married or had children. There was really no one to carry on his story. Enlistment records on Ancestry.com (no plug) tell me he enlisted on March 7, 1942, in Fort Lauderdale, Florida. They put him down as enlistment for the duration of the war or other emergency, plus six months, subject to the discretion of the President or otherwise according to the law. In other words, the military owned him. This was just a few months after the attack on Pearl Harbor in December 1941. I know that three years later he died on the battlefield. What happened in between? For that, I had to send off for his official military records, which were a pain to get. Only a direct relative can get a person’s military records. Uncle Aaron didn’t have a wife or kids. His parents were dead (his mom died a few months after he did). He had no living siblings. Fortunately, his sister-in-law (my grandmother) was still living so I made the request in her name with her permission, and I may have fudged a little and listed her as his sister. What we received was something called Individual Deceased Personal File, which really told me nothing about his military record. It did take me to a snowy village in France just after Christmas. Uncle Aaron’s date of death was an estimated January 5, 1945. He was buried fully clothed in a mattress cover with upper extremities disarticulated. I really didn’t need to know that, but there it was. He was buried in Epinal, France. Uncle Aaron is there to this day, above the Moselle River in the foothills of the Vosges Mountains. My cousin make a trek out to the cemetery while living in Paris, becoming the first member of the family to visit Uncle Aaron’s final resting place. He was identified by a tag on his belt and trousers. His cause of death was SFW Rt. Groin, which I gather means he was shot straight through his groin. Ouch. Poor Uncle Aaron. Soldiers going door to door in Wingen. His place of death is listed as Vic. Wingen-sur-moder, France, and the report maintains that he actually died on Jan. 7, 1945. What I think is more likely is that his body was found on Jan. 7, and that he did indeed die very early on Jan. 5. However, we’ll probably never know for sure. Wingen-sur-moder was a small French town that had the misfortune to have a railroad line above it. A railroad line, of course, would be important during wartime. It was snowing and bitterly cold in early January 1945. The snow was waist deep in spots. Germans with experience fighting in Finland attacked. 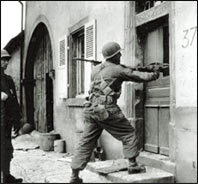 The U.S. Army’s 1st Battalion, 179th Infantry, was in charge of defending the French town but was caught off guard by the surprise attack. North of the town was the 276th Infantry with Uncle Aaron in its ranks. The attack hit late on Jan. 3. The Germans took hold of Wingen and basically wiped out the entire 179th 1st Battalion. Those not killed were injured or captured and herded into the town’s Catholic church. Uncle Aaron wasn’t in the town. He was in Company B, cut off from the rest of the battalion, high above Wingen. 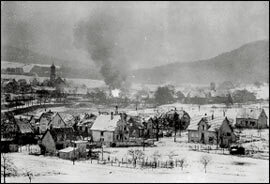 The snowy town of Wingen in January 1945. Uncle Aaron’s company set up camp northeast of Wingen. What the company didn’t know is that they were directly in the SS battalions’ path. They pitched tents, not wanting the clang of shovels against frozen ground to alert the Germans to their location. In other words, they didn’t dig foxholes. The Germans surprised them as they slept, sneaking up and getting on top of the machine guns. The Germans taunted, urging Uncle Aaron and the other American soldiers to fire so they could see where they were and shoot them. It was a massacre. Uncle Aaron posthumously received the Purple Heart for his service. I hope he’s resting in peace.